I learned about the west from Wile E. Coyote illustrations by Chuck Jones. I empathize completely with Tom Hanks. I first learned about western deserts from Chuck Jones. 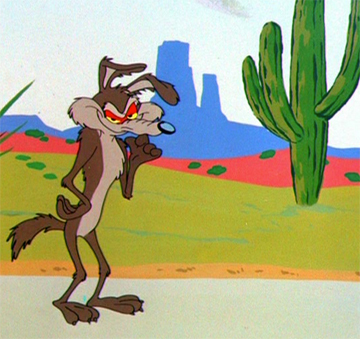 Many of us are familiar with the classic desert scenes of Wile E. Coyote hot on the feathered tail of Roadrunner. The bird spins away through a landscape of stark buttes and many armed cacti. But when you see it in a cartoon, it’s just that, a fantasy. A fabrication. An abstraction. Can it actually be real? I now am living in what is called the Upper Sonoran desert. It’s not an illusion. It’s stark and real. It is part of an immense region with an ecosystem that contains beautiful cacti as well as sweeping vistas of sagebrush or four-winged salt bush, piñon trees and cedars. But our cacti are relatively small. 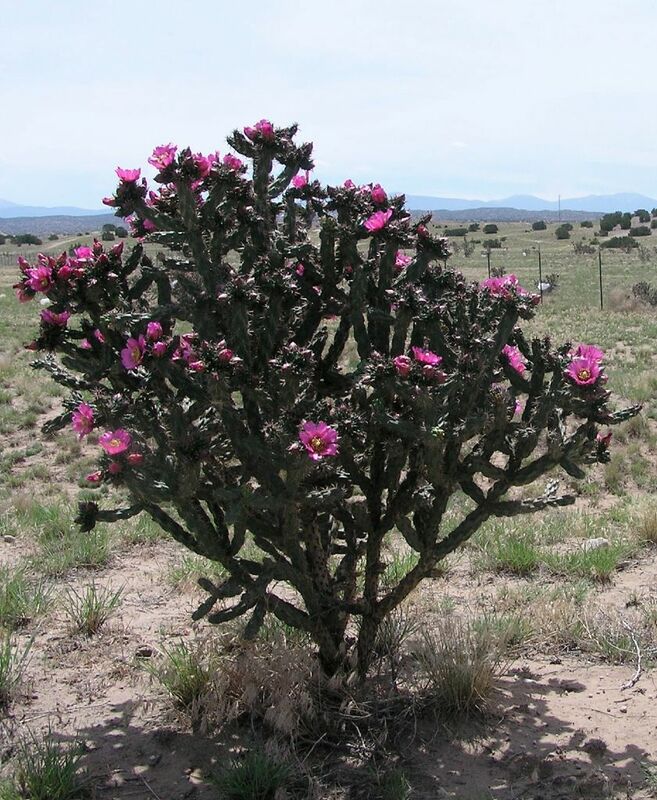 The photo on the right shows a large blooming cholla cactus not too far from home. On our way back from the opening at Lotusland we swung south to Tucson to visit the Arizona Sonora Desert Museum which is right next to Saguaro National Park. They are both in the Lower Sonoroan desert which extends southwards into Mexico. 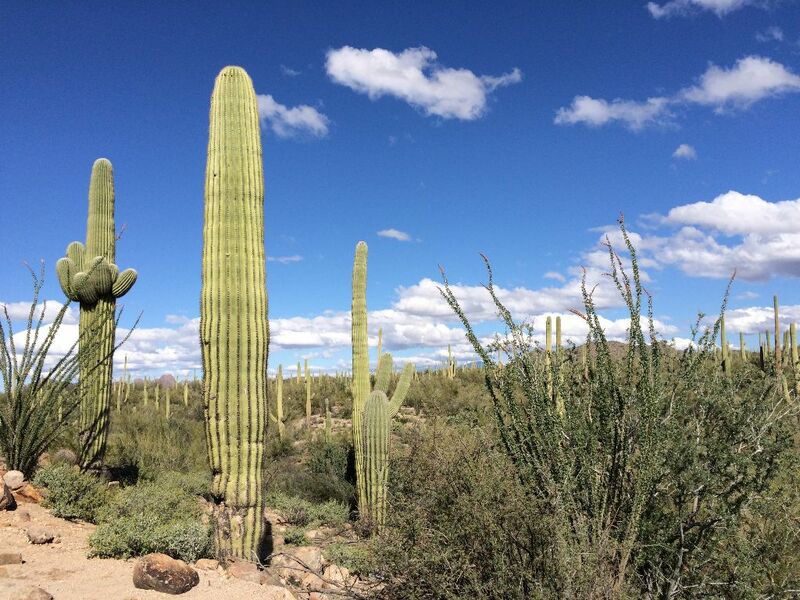 Wile E. Coyote’s landscape is filled with Saguaro cacti. Their spiny spires tower over the landscape. Saguaro cactus. The one on the left has several arms so it must be at least 75 years old or more. Cactus are a daunting subject for painting because of the intricate details. So many spines! I’ve only undertaken that challenge a few times, but I may soon be working with the topic again. Saguaro have very interesting individual personalities! 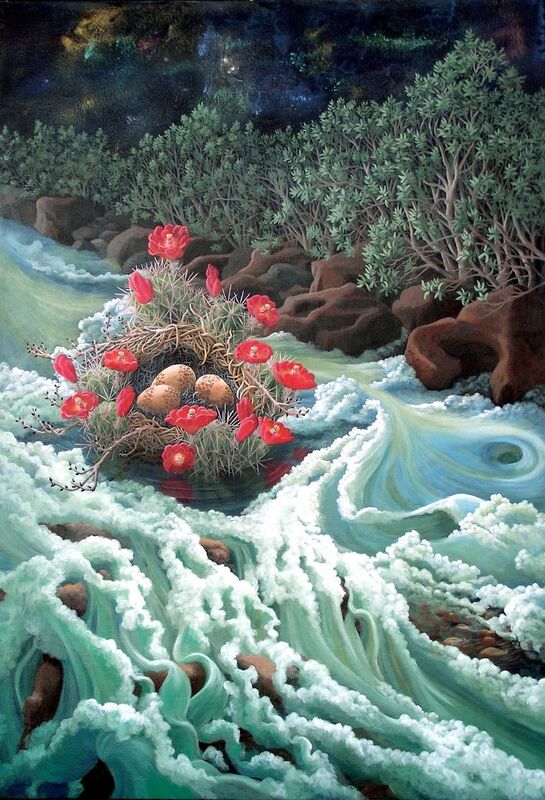 My painting River Nest depicts a nest made of hedgehog cactus, which also grows in the Upper Sonoran desert. The painting now lives in Sweden. The image flowed from somewhere deep in my subconscious. Art is a conversation. The painter makes a mark, then the painting replies, whether it’s real or not. The next mark is in response to the painting, and so the image evolves. Back to the easel now for more evolution! So enjoyed the journey of your words and work. I too hear the story of creation, I appreciate your eloquence.